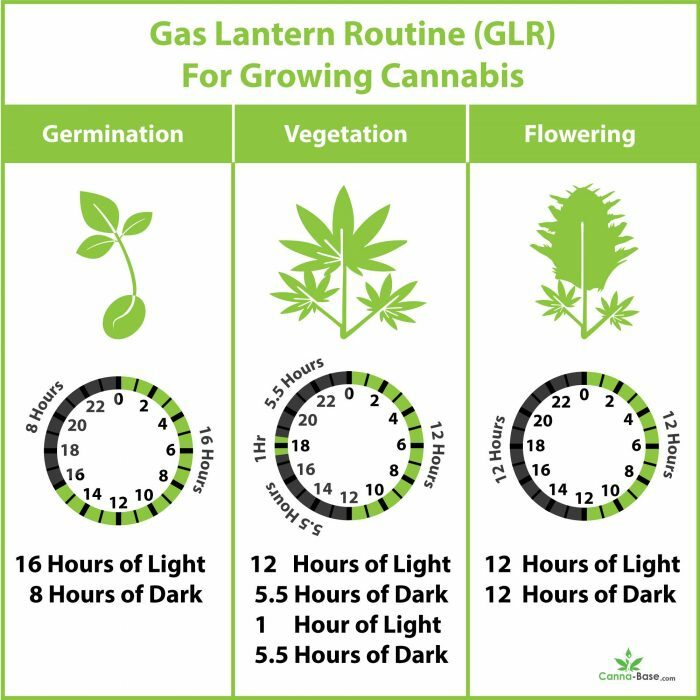 GLR refers to a light schedule known as Gas Lantern Routine. The mythology around this system supposedly dates back to farmers whose crops were being raided by nocturnal pests and they would go out at night with gas lanterns to chase them away. What they noticed however is that their crops were not flowering and stayed in a vegetative state because of the light interruption in the middle of their sleeping hours. Cannabis growers have adapted this system and we can tell you that it works very well. Essentially what we are doing is using a flowering cycle which is usually 12 hours of light 12 of total darkness and interrupting the ‘’dark’’ hours right in the middle by waking them up for one hour. It helps a lot with excessive heat and is recommended for places with very high temperatures, such as desert regions. Light comes on at 20:00pm and goes off at 08:00am the following morning. Light goes on at 13:30pm and off again at 14.30pm and stays off until 20:00pm. (5.5hrs off – 1hr on – 5.5hrs off). This equates to a light period of 12 hours followed by a dark period of 5.5 hours, a light period of one hour and another dark period of 5.5 hours. What this does is prevents the flowering hormone from activating and sending the plant into a flowering state, instead it stays in a vegetative state. This will help with keeping temperatures down and give you more control over their environment. It may seem complicated but it’s actually really simple to set your timer and away you go. If your temperatures are on the lower side you could even leave the (passive intake) flap on for the 1 hour period in the middle of the day (GLR) and it shouldn’t cause any problems. Either light schedule works really well so choose the one that works best for you. THE Gas light routine is misrepresented, Photoperiodic control discovered in 1920’s enable folks to grow year round, they discovered plants have 3 photoperiods short day long night such as cannabis, long day short night your spring time flowers opium, day neutral, 12-12 is day neutral it adds hours to your flowering schedule, I created the 12-1 paradigm, in flower we use 8 on 16 off. I have light schedule that uses o only 7 hours in veg.